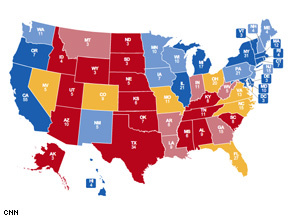 Obama makes major gains on the new CNN Electoral Map. WASHINGTON (CNN) – Polls in five key battleground states in the race for the White House released Tuesday suggest that Sen. Barack Obama is making major gains. The CNN/Time Magazine/Opinion Research Corporation polls of likely voters in Indiana, New Hampshire, North Carolina, Ohio and Wisconsin reflect a significant nationwide shift toward the Democratic presidential nominee. In Indiana, 51 percent of likely voters say Sen. John McCain, R-Arizona, is their choice for president, with 46 percent backing Obama. Indiana went for George W. Bush by 21 points four years ago; the Democrats have not carried the state since 1964. Obama has made significant strides in New Hampshire, a state which is credited with reviving McCain’s GOP primary campaign in both 2000 and 2008. Fifty-three percent of the state’s likely voters are backing Obama, while 45 percent are supporting McCain. Obama’s eight-point lead is larger than the five-point lead held by Obama in the last CNN New Hampshire poll taken in the beginning of September. Bush squeezed out a slender one-point win in the state in 2000 - but four years ago, John Kerry narrowly carried the one-time GOP stronghold. In North Carolina, the two major party nominees are locked in a dead heat, with McCain and Obama each claiming the support of 49 percent of likely voters. The last Democrat to carry North Carolina was Jimmy Carter in 1976. The state’s 15 electoral votes are considered to be critical to any successful Republican presidential campaign. McCain currently trails Obama by three points in Ohio; 50 percent of likely voters favor Obama, while 47 percent favor McCain. No Republican has won the White House without carrying the state. In Wisconsin, which hasn’t voted Republican since 1984, Obama is holding a 51 to 46 percent lead among likely voters. The new CNN/Time Magazine/Opinion Research Corporation polls are behind several new shifts in the CNN Electoral College map. Finally, CNN is switching Michigan and its 17 electoral votes from leaning toward Obama to safe for Obama. The McCain campaign announced last week that it was shifting its resources out of the once hotly-contested Rust Belt state, instead intensify efforts in battleground states like Pennsylvania and Ohio. With these moves, CNN estimates that if the presidential election were held today, Obama would win states with 264 electoral votes and McCain would win states with 174 electoral votes, with 100 electoral votes still up for grabs. To win the White House, 270 electoral votes are needed. Obama’s lead has expanded by 29 electoral votes when compared his margin in CNN’s last electoral map, which was released on October 1. The CNN/Time Magazine/Opinion Research Corporation polls were conduced October 3-6, with 677 likely voters in Indiana; 813 likely voters in New Hampshire; 666 likely voters in North Carolina; 749 likely voters in Ohio; and 859 likely voters in Wisconsin, all questioned by telephone. The survey’s sampling error is plus or minus 3.5 percentage points in New Hampshire, Ohio and Wisconsin, and plus or minus 4 percentage points in Indiana and North Carolina. Keep up the mudslinging, lies, and distortion, McCain/Palin. The more you do it, and the nastier you get, the further you fall behind. This country is FED UP with campaign tactics like yours and with your bankrupt economic policy that favors the rich. Good riddance to Bush, Cheney, and both of you-January 20 can't come fast enough!!!! The sad part is that still so many Americans would vote GOP. You have a couple of mean-spirited liars on their ticket, one of which is largely clueless about most important issues of governance, and still nearly half the country will vote for them. It makes me think that anyone could be put up there and so long as they represented one of the major parties, nearly half the country would immediately get behind them. We need to get away from the 2 party system. Think people! Thank goodness there are enough people in the middle who will vote Obama-Biden, not perfect but oh so much better than the alternative. The economy is bad news for McBush. Regardless of what he says, McBush and other Republicans are joined at the hip to the most unpopular president in recent memory. Had these been good economic times, Obama wouldn't have stood a chance. If this war would have been valid and successful, Obama wouldn't have stood a chance. That "the surge is working" is meaningless when you consider the real fight is with the Taliban and al-Qaeada in Afghanistan, not the late Saddam and Iraq. So the surge is meaningless, the war in Iraq was and remains unnecessary, not to mention the American people are footing the bill for a country that has a budget surplus in excess of $70 million. Even if this war in Iraq is ultimately successful, it was unnecessary. The fact of the matter is, McBush is void of any real ideas. He is out of touch with the real day-to-day goings-on in this country. His overzealous support for the Iraq war may be due to his involvement in the Viet Nam war, but that makes him thoroughly unfit for command. I would like to thank McCain and encourage he and Caribou Barbie to continue spreading outright lies and half truths as much as possible. "your continued efforts in electing Barack Obama and Joe Biden are sincerely appreciated by the American people as we look forward to exiting eight years of the most corrupt and incompetent administration in the history of America"
Neo-Conservative far right fringe politics will fail as they should. The "Fat Lady" is about to sing! 28 more days!!! Glad to hear that more minds are waking up now! All I hope is that Obama campaign is able to stick to their consistent optimism and stick to real issues. YOu are so close to victory. Do not ever peer yourself to McWar's low taste. It's evident that our Democracy is in disgraceful shape. That Senator McCain and Obama are the presidential nominees for their respective parties shows the stupidity that has gripped our electorate. Apparently Americans aren’t smart enough for Democracy. Not to worry, McCain will prevail. When your in the cover of darkness of the voting booth, you'll have to ask yourself, "is Obama really ready?" " What has he done?" "in a time of war and economic hardship, is he really the guy we can trust". These are legitimate questions that will arise. My friends, you don't have to ask yourself these questions with John McCain. mccain and his running mate should read this and know that americans are not stupid. a man that said he does not understand the economy is hoping to do well in the polls when the economy is number one issue is simply a dreamer. he has almost lost all the respect that americans have for him because of the way his campaign is trying to shift the focus from the economy to other irrelevant things. pls obama, keep speaking about the issues and your proposed plans to make america a better place. The tide is turning in the right direction for real LEADERSHIP and HOPE, McCain offers us nothing but Bush policies and Im worse off then 8 and 4 yrs ago. I tell my family we can't afford that this month, maybe next month, we shop more in discount and thrift stores, like so many Americans, we make our pennies stretch to the end of the month. McCain has no idea what its like to live paycheck to paycheck and tell his kids no not this time. A young newly married woman was at an airport to fly to Norway and join her husband. The airline said she needed $125. for extra luggage. Through tears the woman could not make them understand that she had no more money A young well dressed man stepped forward and gave her the money she needed. She took down his name and address and promised to repay him as soon as she got to Norway….which she did. The year was 1988 and the young man was Barack Obama. Thats what kind of man he is. That man will be our next president. Around the water cooler talk needs some fact check CNN. Is it true that McCain is cutting Medicare? Did he really call upper Virginians "Communists"? Help us out fact checkers. Medicare is a huge topic that cannot be overlooked. we have a crisis color does not matter. We have a crisis! Let me just tell all of the young Obama supporters out there one thing. Don't be happy with the polls. They are too close. What counts is election day. I've seen plenty of close polling before where the candidate who was losing became the winner. Please make sure you actually vote when it counts! GREAT. I hope this trend continues. If what I expect to see and hear in the next few weeks will be similar to the McCain/Palin attacks, I'm next to positive this map will become ALL BLUE. If anybody from the McCain camp is reading this message, a word from a Hockey Mom.....get that woman off the air!!!!! And you become an intellegent representative discussing your plans in detail. With numbers like these, I think "The Real McCain" will show up for tonight's debate. My question is which McCain will it be. The one from 2000 or 2008? I can see it coming! It is a landslide Obama/Biden 08/12. The more negative McCain/Palin get, the more they are going to turn undecided voters towards Obama/Biden. McCain pledged a clean, respectful campaign, and the voters know that he is damaging his credibility. True Obama's campaign is responding in kind, but it's just that, a response. Good to see America is finally seeing through the sideshow of McBush/Palin. Keep going Barack and Joe, we are almost there!! Good job Obama....keep pressing forward and don't get too distracted by McSame and Pitiful Palin.